the nepalese kitchen, surry hills. | the imperfect peach. Image courtesy of Healthy Soy Cooking. It’s easy to walk past this small, unassuming restaurant without a sideways glance. 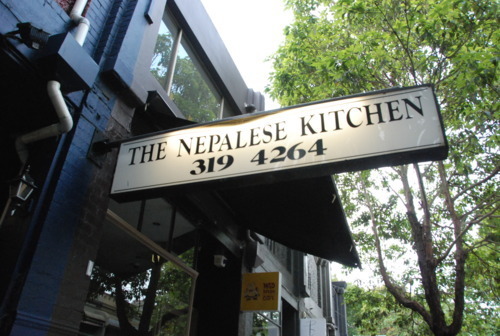 Nestled in among Crown Street’s variety of renowned culinary delights, even some Surry Hills locals haven’t heard of The Nepalese Kitchen before. I didn’t have high expectations of The Nepalese Kitchen, but my dining companion highly recommended it and I’m always up for trying something new. I had no idea what Nepalese cuisine entailed, but that was part of the appeal. On a Saturday night the restaurant, with its plain interior, is bustling with groups of twenty-somethings. Squeezing through the diners there’s a tangibly friendly atmosphere. I find my amigo upstairs where it’s a bit quieter, which suits us well. We order the Momo starter ($9), steamed dumplings with either a spicy chicken, vegetable or spinach and cheese filling (four in a serving). My dining partner recommends the spinach and cheese, which I feel slightly apprehensive about given my recent experience of overly-rich deep fried dumplings with cream cheese and Camembert fillings. However, the spinach and cheese are a lovely combination that isn’t too rich. The pastry is a bit thicker to that of the Chinese dumplings I’m accustomed to, but perhaps that’s a Nepalese thing. The Nepalese Kitchen is BYO (with no corkage)* and this evening we both happen to have brought 2012 South Australian reds; first, a peppery Wrattonbully-Coonawarra Cab Sav which works well with the food. Then after dinner we have a glass of a delicious Barossa Shiraz (which would’ve, perhaps, been an even better compliment to our dishes). Our mains arrive quickly whilst we’re still eating our Momos. We’re sharing the house specialty, Boka ko Massu ($18.50), which is a goat curry with a thick tomato, cumin and cinnamon sauce. This is really lovely; the meat is tender and the flavours are delicious without being overpowering. We also have the Bhanta curry ($12.90). The combination of eggplant, potato and cherry tomatoes may sound a bit random, but it tastes great and makes for a satisfying vegetarian option. Well, hey! Here’s a hastily-taken snap of our mains, with the Bhanta at front and the Boka ko Massu at the back. We also ordered two portions or basmati rice and two roti (both ~$3 each) to accompany our mains. If When I go back I’ll probably only order one portion of rice as there was more than enough between us. I was surprised by just how much I enjoyed The Nepalese Kitchen and I’m looking forward to going back. Couldn’t be bothered reading any of the above? Food: Yummy curries – great for those who want to try something a bit different. Alcohol: BYO (and no corkage!) We found that full-bodied reds worked well with the food. Noise level: If you find it a bit noisy and crowded downstairs try the upstairs or courtyard dining areas. Fun fact: You can book a room upstairs where you can sit and eat upon cushions on the floor – traditional Nepalese style. Is there a high chance that you and your stomach will enjoy your time here? : Yes. The Nepalese Kitchen: Nominee for the “Best Hidden Gem” and “Best Cheap Eats” awards. Find it at 481 Crown Street, Surry Hills NSW. *This plus the overall good value for money may explain why the average age here is 25.